High speed fibre broadband is now available to order in Ardgay. Fibre services are completely different to existing broadband services, and download speeds in the village will see a boost from a previous maximum of 8Mbps, to up to 76Mbps. You can check your phone number on the interactive map at www.hie.co.uk/fibre This will tell you whether you are part of the current network, and what speeds you might expect on your individual line. Stuart Robertson, digital director at HIE said: "If services are available you do have to order. You can use comparison websites to shop around for the best fibre internet deal. It may not cost you any more than your current service. "The new services are delivered by fibre cabinets, and being able to order depends on two things - being connected into the cabinet and your distance from it. 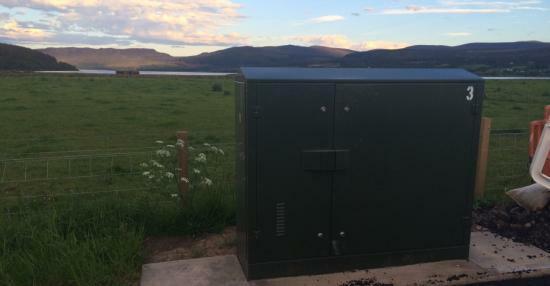 "There are three fibre cabinets in the local area. The latest one is for Ardgay village, and there are two which cover Bonar Bridge (one in the village itself and the other which sits just outside Ardgay Game). "The network has been built as part of the Digital Scotland Superfast Broadband project, led in the region by HIE. Public investment is helping extend superfast broadband access to as many towns and villages as possible which would not have been reached by the commercial market. It is funded by the Scottish Government, the UK Government, HIE itself and private sector partner BT, whose local network business Openreach is delivering the work on the ground. "It provides the same kind of mainstream network which is available across the UK, and as it is open to all providers to allow you to shop around for best value." If you order the broadband service, it is delivered along your existing telephone line from the cabinet. Your provider may send you a new router for the house, and they will advise you if an engineer needs to come to the house, it's not always necessary. The roll-out isn't reaching everyone. The project has built as many cabinets as the budget allows to reach as many people as possible. However, the cabinets can't reach everyone as the broadband signal diminishes on the phone line, and those more than 2kms away may not see a benefit. It is always worth confirming with your provider even if you are at the outer limits. The Scottish Government is currently looking at ways to ensure that all homes and businesses can access superfast broadband by 2021. A further project is being planned to help reach further. In the meantime any home which can't access the new services, and which has a download speed of less than 2 Mbps, can apply for a better broadband voucher to help with the installation costs of a satellite or wireless option. Two brothers are celebrating as the first spirit at their new micro distillery in Dornoch began to flow this month. Phil and Simon Thompson's dream of opening their own distillery has become a reality as the Dornoch Distillery opened for business producing hand distilled gin, vodka, rum and whisky. A new community-owned sports facility is being formally opened in Sutherland later this week. The Scourie Sports Pavilion will be opened on Saturday 7 June by Lady Jane Grosvenor followed by the annual Far North Shinty Sixes competition. Is your business a winner? Highlands and Islands Enterprise (HIE) is offering a two-day trip worth �1,000 to a high-profile event in Glasgow for Scotland's leading entrepreneurs. If your business is based within the HIE geographical area, you've got at least one ready-for-market product or service and are actively seeking ways to expand your sales base beyond local boundaries, you are eligible to win a maximum of two delegate places at this prestigious event taking place on Friday 5th - Saturday 6th October 2007. Highlands and Islands food and drink producers have attributed �9.2 million of new sales to events and exhibitions organised by Highlands and Islands Enterprise (HIE), through its UK Market Development programme. A recent evaluation of the programme commissioned by HIE has demonstrated that bringing together food and drink producers and buyers is an effective way for speciality companies in the Highlands and Islands to do business. A replica of the 30 foot bronze statue commemorating the Highland Clearances is being cast and shipped to the Canadian City of Winnipeg. 'The Emigrants' memorial in the Sutherland town of Helmsdale was originally cast by Highland foundry Black Isle Bronze in 2003. Dornoch Academy pupils have been given a taste of running their own business over the past few weeks, by creating a new ice cream. The pupils have been working with Harry Gow and Highland Fine Cheeses on a Food and Drink School's Challenge, which culminates in a final event on Saturday 15 March for 12 S3 pupils from the school. Highlands and Islands Local Food Network (HILFN) is to set up a food apprenticeship to train a new generation of food growers in the area - the first course of its kind in Scotland. More and more consumers in the Highlands and Islands are choosing to eat healthily and shop locally which is leading to a shortage of locally grown fruit and vegetables in many parts of the north. A team of 6th year pupils at Golspie High School will find out later this week if they've made the grade as a one-off enterprise programme concludes in a series of business presentations by them. The programme held over three, one-day workshops which started in September was designed by Dornoch-based management consultant Iain Fraser to expose the senior pupils to theories, processes and checklists in new product generation, strategic business thinking, marketing and entrepreneurship.